I would love to see the new regional trains that link Swindon to Westbury, via Chippenham, Melksham and Trowbridge, and with onward connections to Warminster, Salisbury and Frome, succeed. And indeed initial passenger numbers are quietly encouraging. But how do we reach people? How do we make people aware that the services exist, especially in Melksham where for years very few people have ever gone to the station because very few trains ever called there? A multithreaded approach is vital. I've learned this from SCOB work (Shadow Community Operatios Board) where the group put out material in 10 different ways and yet we still got complaints of lack of information. So - there's information in the local press. On the radio. Put through people's letter boxes. In the library, the town hall, the Tourist Information Centre. We've spoken and speak to many rail user groups. Wiltshire Council / Connecting Wiltshire's travel planners are knocking on doors. We're informing business contacts via the Chambers of Commerce, and so on. And, yes, there are posters at the station. But is that enough? Is there more we could be doing? I've commented in the past about going to rail meetings that are supposed to be "user group"s but in practise many of the members are strong and valuable on experience, but are retired / semi-retired and their rail use has transformed from business and community use to less frequent leaisure use; only the occasonal daily user of trains will have the time for / attend such meetings, and so they rarely represent the work / education sector. And in many ways we at the Melksham Railway Development Group / TransWilts Community Rail Partnership are also just such a user group trying to reach wider; we have the same biased metrics and we're certaily not going to indulge in positive discriminiation to get our profile more balanced. And actually I'm quite happy with our bunch of older men doing things for the people who are in the prime of their years, working hard, brininging up familiy and with little time to be involved, and in doing things for their teenage and grown children who perhaps haven't flown the nest yet - but we need to know who those people are, what they need, what they would like, how to provide for them, and to know how to reach them to say we have provided it (in such a way that they notice). The Coffee Shop Forum is one way we bring the groups together - member polls over the years have shown that its age profile is considerably younger than that of the MRDG or WWRUG meetings, where a senior FGW representative may be the youngest person in the room. And we know that away from members the forum is extensively read too - sometimes people tell us, and at other times there are little clues in other ways. But I would be surprised if more than 1 in 500 passengers leaving Paddington has ever visited the forum. And those are the exisitng and knowledgable ones - it really doesn't help us reach the late teens / early twentys community in towns like Melksham, Trowbridge, Westbury and Frome who will jump in the car to drive to Chippenham or Swindon, cursing the cost of parking and the time taken. As well as web sites (such as the TransWilts CRP one), much has moved on to Twitter and Facebook these days - and as something of an experiment I've been puting a bit of activity onto the Facebook TransWilts page and boosting some of the posts a little. Here are some of the (public) comments / questions. And I've found it educational to see what people are asking; most of the answers have been staightforward to provide and other have jumped in too, but there are odd bits of mis-information too which have to be debunked. Is this a plan or is it already happening? Some improvement to what was (or wasn't) available before, but still doesn't make Melksham commutable to London. Is there parking at melksham and if so how much? Not till may hey be good when starts An incorrect statement from the poster. It is running NOW! I never knew melksham had a train station? 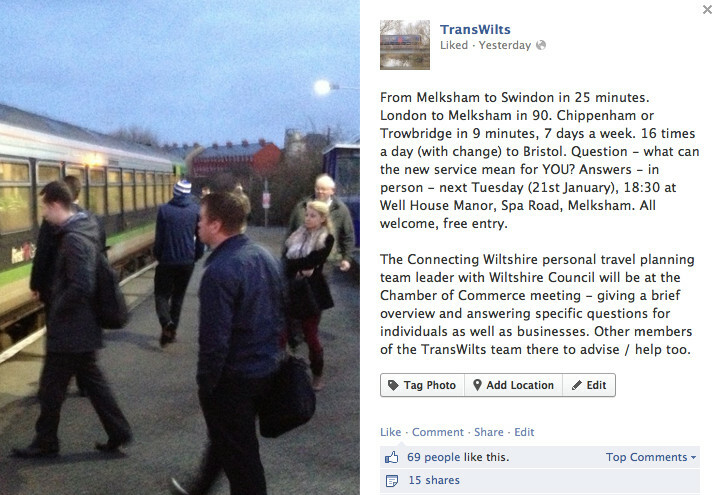 Used this service to swindon a lot recently and when i have told people they didn't know it was possible! Its what melksham needs! My only issue was it cost [c2]ã6.60 a single and [c2]ã6.70 return but there is no open return so if i go overnight it costs double! They to direct trains to Trowbridge since when?! Can you just get on and buy the ticket on the train ? Not many seat available I imagine? How much the return ticket for next day or so to Cheltenham Spa if I take the 7:20 train? Does train go to trowbridge after 9 and bk before 3 please ? If you wonder what the answer were, see the Facebook page itself ;-) . That was posted yesterday morning, and it's good to see the feedback - and the number of "likes" and "shares" which mean that people have see enough to note the content, or are recommending the post to their friends to read.I have no prior experience of promoting in this way - so I don't know if I've got a super result there, or a pathetic one that's been useful only as a learning curve. As an admin of the TransWilts facebook page, can also look at some of the statistical metrics of the people we've reached - here, for example, is a graph showing the age and gender profile of our responding ("engaged") audience, and note the town mix profile at the bottom. * Strong response Melksham, Trowbridge a little lower, Chippehnam 'tough' - although I've no control to measure against so I think Chippenham might be more normal. No responses yet from Westbury / Frome / Warminster / Swindon; we will be doing a similar post and boost at least for Westbury in the near future, but while there have been major but now-sorted errors in the fares, it would have been unwise to stoke the fires. I am also - delighted - to note the number of people who have come back and liked the answers posted, and / or said "thank you". 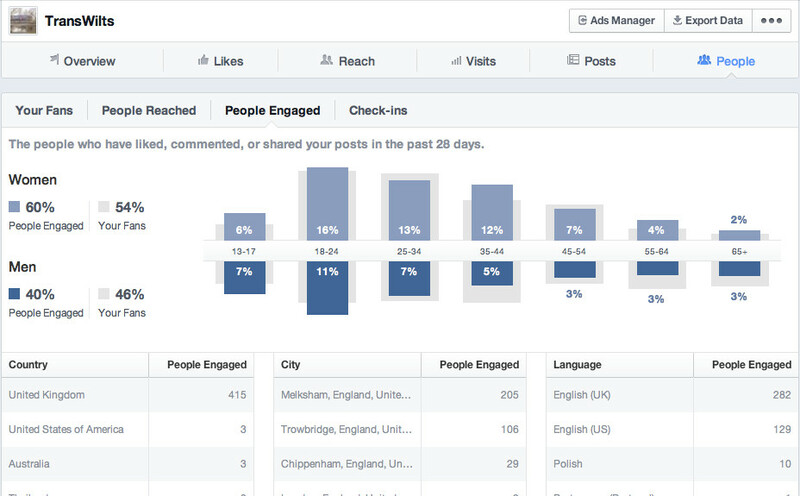 That's all credit to the Facebook audience, and pretty unusual in the product support world. This is a work in progress / sharing my experiences post in the hope that it gives others food for thought, and gives people the opportunity to ask me questions and make suggestions.